This card, postmarked 1909, shows The Cottage, a fairly large house that stood roughly on the site of Cheyne Court. 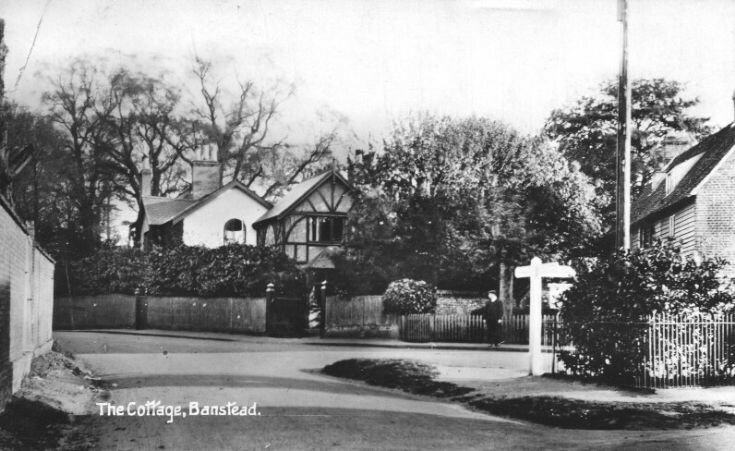 The view ahead is looking south down Park Road whilst the High Street proceeds to the right, the signpost and railings occupying the central island where the war memorial was to be placed in 1921. The wall to the left is that fronting Well House. The photograph would have been taken from the top end of Sutton Lane. The island was not used as a roundabout at that time, as 'traffic' ran down both sides of each lane. This continued even after the memorial replaced the Laurel bush. The portion of road at the forefront of this picture is now the large grassy area which runs along the Well House wall.